Joint teams of NIA, UP Anti terrorism squad (ATS) & Delhi Police have busted a new ISIS inspired terror module ‘Harkat ul Harb e Islam’ which was allegedly planning to carry out multiple terror attacks at crowded places & iconic spots and assassinate important individuals. Security agencies have carried out raids at 17 separate locations (6 in Delhi and 11 in UP) and arrested 10 people – 5 from Western UP district of Amroha & 5 from north-east Delhi – while 6 more are being questioned. Hindi daily Dainik Jagran reports that the module was headed by 29-year-old Mufti Mohammad Suhail, a maulvi (Muslim cleric) in an Amroha mosque, who was currently residing in Delhi’s Jafrabad area. One of those arrested is 24-year-old Anas Yunus, a civil engineering student of Amity University, Noida, who played a key role in assembling electronics for the bombs. 20-year-old Zubair Malik, a 3rd year DU student, used forged documents to buy multiple SIMs. Others arrested include a cloth shop owner, two brothers who run a welding business, an auto driver. Most of those arrested are in the 20-30 years age group. Initial investigation suggests that the group raised funding for their terror plans on their own – some even stole jewelry from their own homes. As per NIA joint director Alok Mittal, the group was planning on serial blasts, including fidayeen (suicide) attacks. 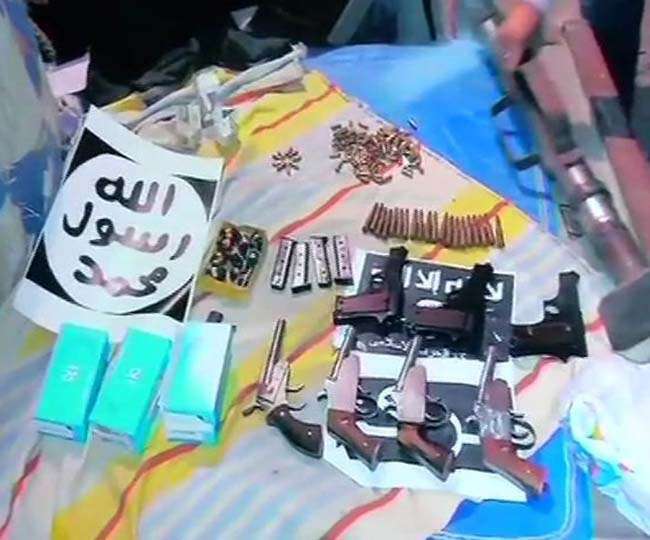 A huge cache of weapons, including 12 pistols and a self-designed rocket launcher, and bomb making material enough to make several remote-controlled IEDs has been seized during the raids. This includes 25 kg potassium nitrate, 112 alarms, 91 mobiles, 134 SIM cards etc. Islamic State (also known as ISIS) propaganda material & 3 laptops have also been seized. The terror module was under ISIS surveillance for some time, and used mobile apps WhatsApp and Telegram for communication. Times of India reports that the module was allegedly involved in Ujjain-Bhopal train blast and two of the accused had carried the bomb used in the terror attack to Lucknow from Kanpur on a motorcycle sporting an Indian Air Force (IAF) flag.